Angelina Jolie is unbothered that her estranged husband Brad Pitt is no longer in her life. She and her children looked happy as they hit the slopes in Colorado to celebrate the new year. The family, which is probably glad to see the back of 2016 after a messy split between Angelina and her ex Brad Pitt , were pictured all smiles in Crested Butte on New Year's Day. 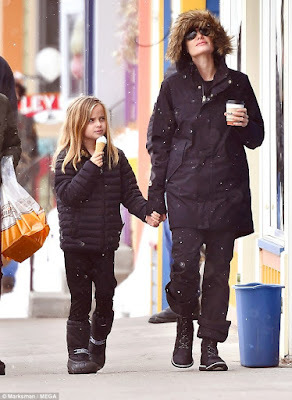 They arrived in Colorado this week for a fun-filled holiday on the ski slopes, DailyMail.com reports.So Angelina Jolie took some time to explore the winter resort itself on Sunday as she took her eight-year-old twins Knox and Vivienne, and daughter Shiloh, 10, for an ice-cream in Crested Butte. The actress, 41, and her sweet brood looked picture perfect as they hit the frosty streets to indulge in a tasty treat following an afternoon in the snow. More pics below. Jolie's estranged husband Brad Pitt did not accompany them on the trip, after he and Angelina split in September. The actor is still coming to terms with having only supervised visits with his children. 'Brad's anguish is palpable right now. He desperately misses having his kids with him at Christmas and New Year. These supervised visits are sheer hell on him. He’s broken down in tears so many times – he’s not ashamed to cry any more. 'He reportedly met five of his children in Los Angeles on Christmas Day – but Maddox didn’t want to see him.